We have lived in our Portland neighborhood for more than twenty years. In that time we have observed the lives of our neighbors, the growth of their children from babies to adults and the peculiarities of their habits, developing theories along the way as to why they do the things they do. In much the same way, contributor Anthony Boutard and his wife Carol have tracked the lives of their neighbors at Ayers Creek Farm, the birds, insects and other denizens that share their habitat. As we noted almost a month ago, our two owl chicks had left the nest and entered into a state of seclusion. We could hear their faint mewing, akin that of a hungry kitten, but small, well-camouflaged and tucked into the tree boughs, they remained out of sight. Someone unaccustomed to this moment might assume they had died or flown away. It took us a few years to understand this time in the birds' lives. Last week, the young owls emerged from their month of seclusion. They can hop and glide from branch to branch and make short attempts at flight. It will be another month before their growing muscles and feathers will allow them to fly with their mother. The home range of the great horned owl (Bubo virginianus) extends from northern Argentina to Alaska, including all of the mainland United States, from the coasts to the mountains, from the rain forest to the desert. Within this range, the size, habits and coloration of the owl vary according to habitat. These variations are summarized and characterized by about 20 subspecies, though the variations are not really discrete but are representative for certain geographic areas. The great horned owls that Carol and I observed in New England are longer in body and bear more brown and cinnamon plumage than their Oregon brethren. In the Garry oaks of our savannah, the eastern form would be conspicuous, but the local variant blends in perfectly, as seen at left (click photo to enlarge). The young owl is easily mistaken for a stub of a branch, or just more bark. As they feel more secure and move further out onto the branches, their silhouette betrays them. They have also become noisier, uttering irritating screeches even during the day. By the end of autumn, they will disperse. That is the most hazardous moment they will encounter, as they seek a safe breeding territory. Cars and power lines will pose a big threat, as will other predators and trigger-happy humans. In past winters, we have seen owl carcasses along Spring Hill Road. These large owls can live up to 30 years; the parents of these young owls have been here at least 18 years, as far as we can tell. However, attrition is very high in that dispersal period and the harsh reality is that these two birds will probably never feed their own young. Though any that survive that first year can expect a long life. References indicate an average of about 22 years. As children, my parents brought us to the Museum of Science in Boston. Every year I looked forward to the demonstration with Spooky the great horned owl (right), the engaging ambassador of the Strigiformes, the owl order. 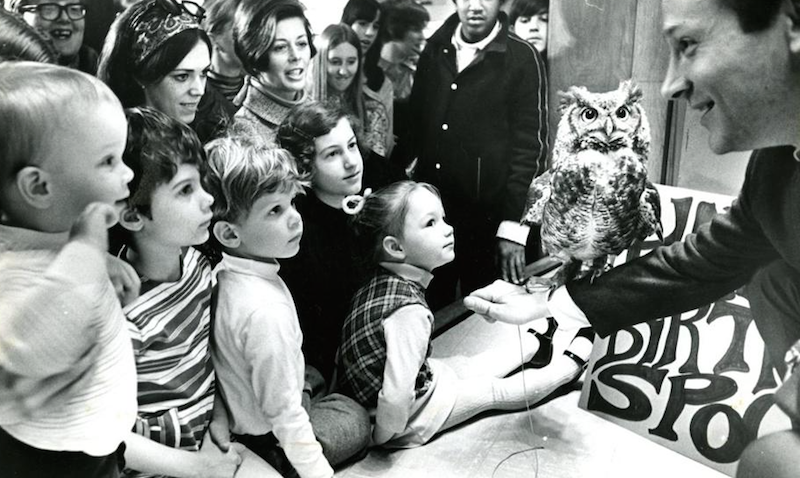 Years later, our daughter Caroline and I went to the museum and they had an owl there. I went up to admire the bird and told its handler about my fond memories of Spooky. He smiled and said "This is Spooky." At that point, the owl was already older than me, and lived for several more years, dying at 38. With luck, the owls outside my window could actually outlive me. 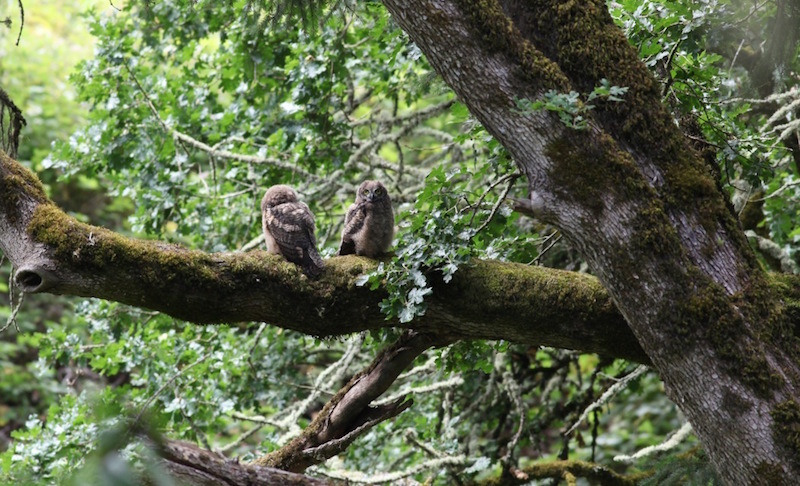 Interestingly, a few years ago, we reported that the Ayers Creek owls raised three young. The third was never strong and could barely fly even as it acquired its adult plumage. Through the autumn and into the following spring we would occasionally flush it. The owl would glide low and into the brush. It retained its screechy, immature call. Eventually it disappeared, probably died one way or another, as it was obviously incapable of the dispersal flight. Authors are given to lurid stories about owl clutches consuming their weaker siblings. 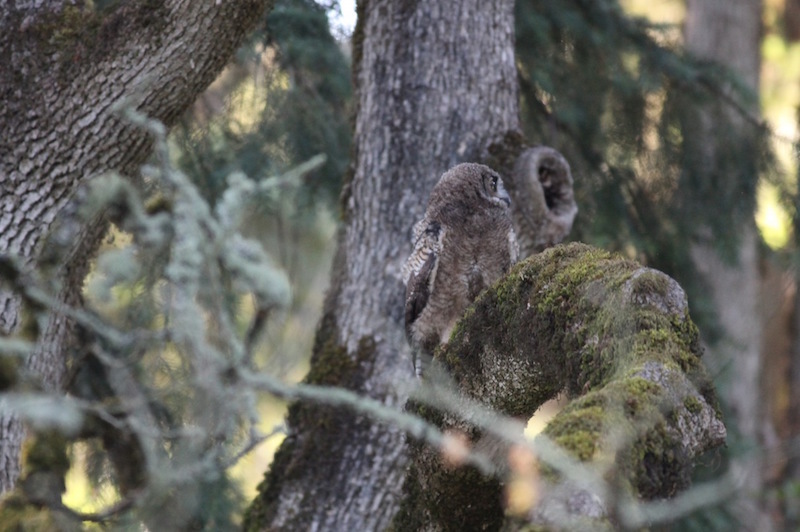 After observing the owls and their young at Ayers Creek for just shy of two decades, I find such tales unbelievable, an artifact of our desire to remain aloof from the creatures that surround us. I have watched the young owls sit and groom one another, and huddle together when crows or hawks pass overhead. They share their food and the younger, smaller sibling is indistinguishable after three months. The Ayers Creek chicks have always matured together, and when rodents are scarce they simply grow a little slower. That is happening this year. Even that obviously weaker third sibling made it to maturity and was probably hobbled more by genetic problems due to its parents' unusual fecundity than a lack of food. Breeding does carry a heavy toll for the hen in particular. At least, that is my hunch. Photos of owlets by Anthony Boutard. Photo of Spooky from The Boston Globe.